This box of 20 individual peel and stick luggage labels are suitable for scrapbooking, decoupage, gift wrapping and, of course the adornment of old trunks and luggage. 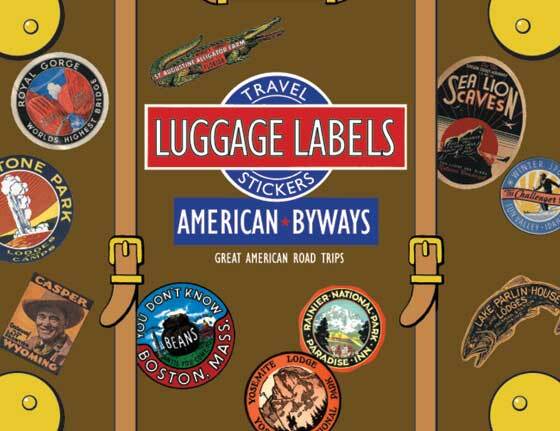 The labels in this selection allow you to pretend you are on an auto trip around a bygone America, stopping at all the interesting tourist attractions as you go. First, a Maine fishing lodge, then the world's largest alligator farm, then the overseas highway to Key West, then west to Yellowstone, Pike's Peak, Death Valley, the Soboba Mineral Hot Springs, and glorious Mt. Rainier.